This article guides you in how to copy music from your iPod, iPhone or iPad to your iTunes library. Please use our Droid Transfer software if you need to transfer music between an Android phone and iTunes. This functionality is only available if iTunes is installed on your computer. TouchCopy can copy iPod and iPhone songs and videos in any format that your device is capable of playing, including MP3, AAC, WAV, WMV, MP4 etc. TouchCopy does not perform any file conversion on your songs or videos. How to Transfer Music from iPhone to iTunes - You can use the TouchCopy Back Up button to copy all your music, video, audio books, podcasts and playlists to your iTunes library. Alternatively, TouchCopy can perform a comparison between the content on your iPod and the content in your iTunes library and display a list of tracks that have not yet been copied to iTunes. See Reports for more details. You can also copy just a selection of iPod and iPhone content. Once you have made a selection in TouchCopy (see Browsing your music ), you can transfer it into your iTunes library by pressing the "Copy to iTunes" button in the TouchCopy Control Bar. TouchCopy will display the progress of the copy operation in the Control Bar. The status bar at the bottom of TouchCopy will tell you when the transfer is complete. If transferring songs displayed as a result of an TouchCopy search, you have the option to create a playlist with the same name of the search text. See the Options menu in TouchCopy for more details. To transfer your playlists from your iPod or iOS device into iTunes select the Playlists you want from the source list in TouchCopy. You can select multiple playlists by CTRL-Clicking items in this list. 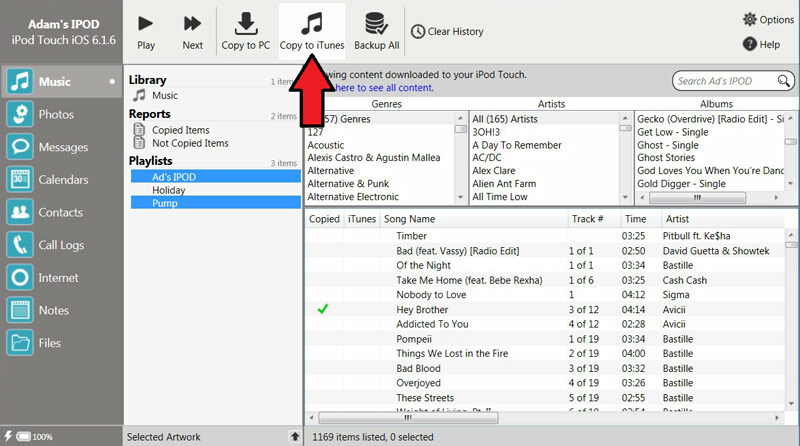 Once you have selected your Playlists - click the "Copy to iTunes" button in TouchCopy. When transferring a playlist into iTunes, the songs are transferred and a new playlist of the same name is created. Note that "smart playlists" and "genius playlists" are copied into iTunes as ordinary playlists. If a track is already in your iTunes main Library, TouchCopy will not create a duplicate of that track in iTunes, it will just add the track to the Playlist. Track was successfully copied to your iTunes including all the meta data. Track could not be copied to iTunes. Tracks that successfully transferred into iTunes will be shown in the "Items Copied" report in TouchCopy. See Reports for further details.